We finally have what seems like a sunny summer morning! So much rain this month! Our grass is springlike green and beautiful but needs to be cut. It is too soggy so it will keep growing until it hopefully gets cut later this week as it dries out. A little mushroom crop popped up. There is not much color in our gardens right now, we are in an in between stage between late spring bloomers and summer bloomers. Some yellow blooms. The calendula that are sprinkled throughout the border are opening, they are in bloom for most of the summer. The last of the yellow flag iris from the two clumps in the pond. I replaced the pansies and used yellow lantana in the pots again to keep it simple. Some nasturtium and poppies I seeded directly into the border are coming up. They are not exactly where I put them but look pretty mixed with the lavender. The pond is wonderful right now. The herbs are doing well with the exception of the basil. Need more sun and warmth for that to take off. The parsley is very happy! And I am a crazy pinner lately, so many ideas in my head for building our new house. Trying to get my head around the design and details to feel relaxed about it all. Not there yet! At all. We are getting small chores done in preparation for the house being put on the market at the beginning of July. Each day is consumed with noticing little things and correcting them. Our handyman has also been quite handy! What are you planning and dreaming of this summer? So much rain, indeed! Just returned home and everything in the garden is very lush. And a bit floppy. 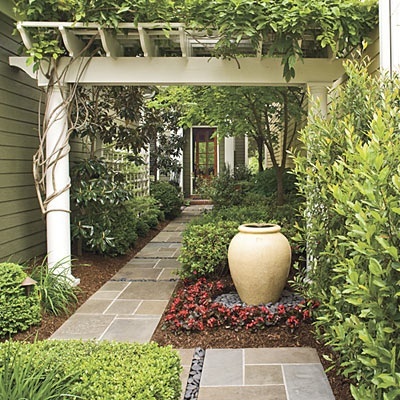 Cindy, I took your advice last year about not pruning my hydrangeas to the ground. I left the woody stems, and they are not flopping over as much. Good luck with getting the house ready. The lucky new owners will not only have a fabulous house, but a beautiful garden complete with a pond filled with charming froggies :) I will miss your mature garden!! 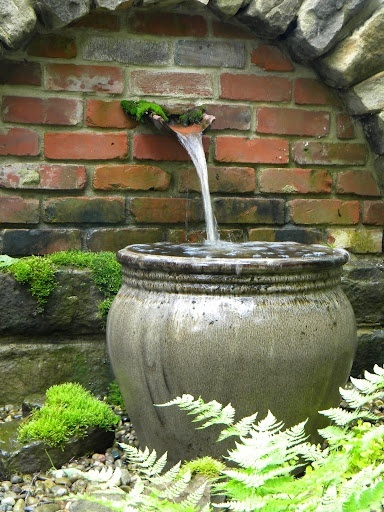 I would love a fountain, and we even have an enormous pot handed down from my great aunt.... but my husband does NOT want the sound of constantly running water in a small courtyard/sitting area! Actually, I'm ok with no water...for now. Maybe someday I will force the issue!!! I do, however, worry about the mosquitoes, even with constantly circulating water; and down here, of course, it's so humid anyway. Well, we will see. I look forward to seeing what you do! I love your yellow lantana, and your herbs are beautiful in the tiered pots. I'm having fun checking out all of your pins and imagining your new home. 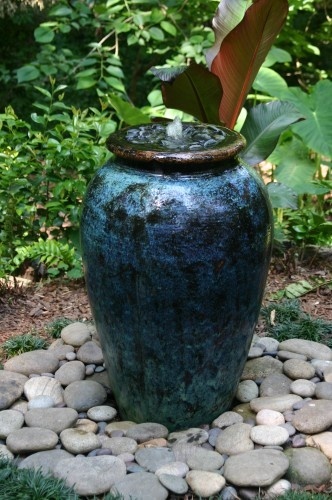 Your inspiration ideas for the fountain will be perfect in a small space. Our garden is still a bit behind yours, but I know our lull is coming soon. Love your photography, as always! Cindy you are so fabulously creative and talented I can't wait to see the fountain you come up with! !